At Nubreed Martial Arts Academy we teach the science of boxing, not the violence. True understanding of boxing is to appreciate it for the skill level of ones ability to hit and not be hit. You may only gain and maintain the necessary physical conditioning needed in boxing through hard work, dedication, motivation and perseverance. Classes begin with a warm-up (shadowboxing, running and jump rope) Moving into intense abdominal and core training, followed by technique training with focus mitts, multiple light and heavy bags and ending with sparring. 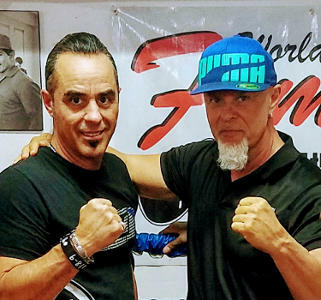 Sifu Luigi Cuellar & World Class Trainer Orlando Cuellar. The Cuellar brothers Cuban boxing heritage shows in their unique style of training fighters. Using diverse training methods to create agile footwork, constant head movement and laser guided punches. Orlando Cuellar brother of Sifu Luigi, was born in Havana, Cuba. He became a pro trainer in 1985, and has a team of pro fighters in multi weight divisions, including former and current champions. Book Your Free Intro Class!